Bedford Tigers booked their place in the East RL Premier Grand Final in emphatic style, posting 10 tries past former champions North Herts Crusaders. The Tigers weathered an early storm and Paul Ryder lifted a huge final tackle kick into the corner where Sean Tribbeck out jumped his opposite number to gather and score the opening try. A second try soon followed as Will Norford finished unopposed from a Tom Albone assist, before leading try scorer Ollie Fountain supported Lee Walker’s brilliant line break to dot down under the posts. Rob Ashton converted all three to give the Tigers an 18-point lead. The Crusaders caught the Tigers defence napping to score a consolation, but their celebrations were very short lived as Karl Siudak gathered the ball from the restart and set Sam Richbell on a typical barnstorming run to score his eighth try in four games since returning from injury. The Tigers didn’t relent in the second half and produced another five-try haul. Ed Strand began proceedings, before Josh Spearing showed all his experience to exploit a numerical advantage from a ruck play. 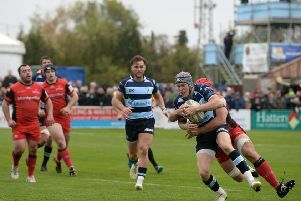 Karl Siudak, Rob Ashton and Sean Tribbeck rounded things off either side of a couple of consolation tries for North Herts to seal a tremendous victory and set up a home grand final against reigning champions St Ives Roosters at Putnoe Woods, kick-off 3pm. Tries: Fountain (2), S Tribbeck (2), Richbell, Norford, Ashton, Siudak, Spearing, Strand. Squad: Spearing, S Tribbeck, D Tribbeck, Fountain, Norford, Walker, Ryder, Siudak, Marshall, Flook, Albone, Ellson, Ashton, Strand, Francis, Scott, Richbell, Sinclair.